Tooth extraction simply refers to the process of removing a tooth from its socket in the jaw. This is a clear-cut procedure that takes a short time to perform. We usually perform normal tooth extraction Richmond Hill with the patient wide-awake using just a local aesthetic to eradicate pain. Although this is a simple procedure, we still recommend that only our well-trained and experienced dentists should be allowed to carry it out. This is because some of the extractions may be more complicated. The complexity of the extraction depends on the position of the tooth, its integrity and the shape of its roots in the alveolar bone. A good example is extracting a tooth buried in the bone. Only a trans alveolar extraction approach can be successful in such a case. Trans alveolar extraction is a surgical procedure that involves cutting through the gum to expose the bone holding the tooth, and using a surgical drill to remove the obscuring bone, extracting the tooth and stitching back the gum to its normal positing. 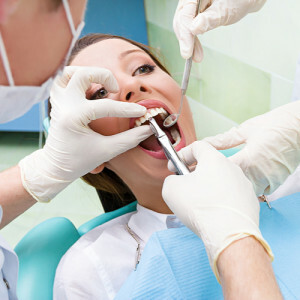 Tooth extraction is an extreme procedure that is only carried out as a last resort. This means that our dentists will only extract a tooth once we determine that it is severely damaged and cannot be repaired through filling, crowning or any other treatment. Tooth extractions can be divided in two main categories, Simple extraction and surgical extraction. We perform simple extraction on the teeth already visible in the mouth. The process involves the use of local anesthetic and instruments that lift the tooth above the gum and grasp the visible portion of the tooth. We used dental forceps to grasp and rock the affected tooth back and forth until all the periodontal ligaments are broken, and the supporting bone widened enough to allow removal of the tooth. These are applied to teeth that are not accessible, usually broken teeth or underdeveloped teeth that are still under the gum line. The process involves the use of general anesthetic, and may involve cutting through soft tissue covering the tooth and bone. In some cases, we may be forced to split the tooth into multiple pieces in order to remove it. Healing process after tooth extraction varies. However, it should take no longer than two weeks for the socket to heal. It may take even longer for the bone and tissues to heal after surgical extractions.